Publishing Genius. 2013. 198 pages. and after the soil that had been mounded nearby had been deposited in the grave by the two quiet men who worked in the cemetery, and after those men themselves had disappeared, a man who had not been among the mourners arrived, and stood where the mourners had been standing. Plain-spoken language delivers a deadpan hue to the somber event, makes the funeral an everyday, ordinary occurrence. A musical rhythm develops as the events accumulate. A similar momentum occurs in “Mike, Thirteen,” a microfiction that condenses the life of a delinquent thirteen-year-old in four paragraphs—starting with the day he stole a can of pop and ending with his motorcycle accident—but it continues beyond Mike’s death. It accounts for the reactions of others and says something about the people remembering Mike. At a friend’s wedding: “When Mike’s friend heard about the accident, he’d asked how it had happened, and was told in a voice of quiet, self-indulgent incredulity.” It is the friend learning about the accident and the “voice of quiet, self-indulgent incredulity” that enhance the momentum of this piece. We encounter this rhythm throughout Figures For An Apocalypse and without fail it suggests an ongoing sense of something before and after each poem, a sense not that we or the poems have missed something, rather a sense that what we believe to be most significant is in fact not, perhaps even misses some valuable point. Edward Mullany successfully delivers the point each time, exploring form with an eye to paring down to the essentials. The brevity throughout this collection makes each moment more resonant. In the framework of absence, the strange gets stranger and the sad darkens to melancholy. A poem such as “The Cities that Remained” captures a corrupt post-apocalyptic cityscape in one sentence: “There were crimes, but no sirens.” The space that surrounds the poem is especially haunting when we start to fill in the blanks, catalogue the crimes occurring without authoritative intervention. In this way, Mullany makes meaning from the places hollowed out of narrative or descriptive matter. Such space could be disappointing for a reader who hankers for filigree, but Mullany’s images and ideas are clear and dark, concerned with the disquieting and strange. Consider, for example, “The House Full of Human Hair”: “If you stood in the garden, and looked up at the windows on the second floor, you could see it pressed up against the windowpanes.” The point-of-view from the garden, the house so full of hair that the windows are full of tresses. Mullany’s is a frighteningly beautiful world, vividly imagined and articulately delivered. off the corpses of men. The birds maintain a sleeping pattern aligned with pre-disaster life. The final disquieting image of birds biting “fingers off the corpses of men” signals a terrifying adaptation, but also alludes to the possibility that an apocalypse has less to do with the world ending and more to do with surviving in a new version of the world. Mullany writes apocalypse with a freshness that is exciting for each of the poems and exciting for poetry. 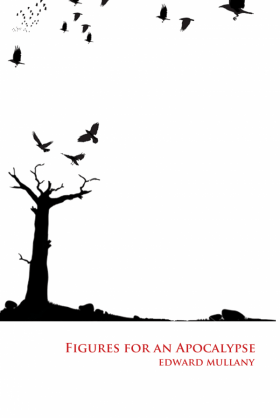 Figures For An Apocalypse speaks to and reflects on a contemporary fascination with catastrophe, suggests new ways to see (and survive) endings as well as beginnings. These hybrid pieces streamline disaster into compact microworlds that stop and start over with an energy that delivers us from one end to the next.